For the second year, Urban Sketchers Seattle took part in the Georgetown Garden Walk, an annual event that culminates with music and art in Oxbow Park. While I enjoy gardens as much as the next sketcher, I knew from last year that they would be crowded and difficult to sketch in, so today I went directly to the park instead. Like last year, I couldn’t resist another sketch of at least the hat part of the legendary and historic Hat ‘n’ Boots. Even better, a jazz band was performing under the hat! 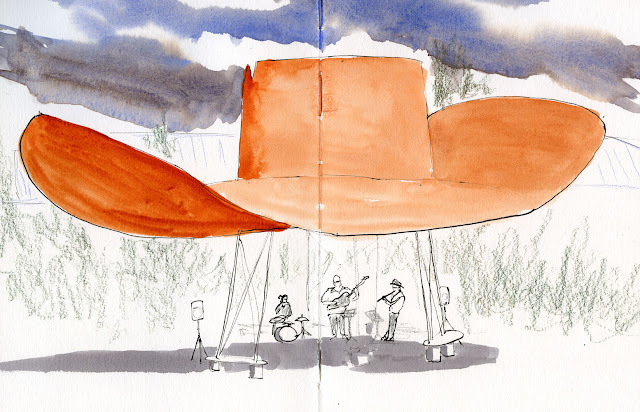 In addition to us sketchers, lots of plein air painters also found Hat ‘n’ Boots to be an inspiring subject. I loved looking around the park and seeing sketchbooks and easels everywhere. Nice Tina! That is some big Hat! It does provide a lot of shade. I am glad they saved it! Thanks, Gail! I've sketched some part of Hat n' Boots three times now, but I never seem to get tired of it!